Home » Pharmacy Technician Employment: How is the Job Market for Pharmacy Technicians? Politicians, the people, and industry insiders have debated and disagreed on the topic of healthcare for decades, but one course has remained stable. From the Medicare and Medicaid programs, which were signed into law on July 30, 1965, to today’s Patient Protection and Affordable Care Act (PPACA), better known as “Obamacare,” the healthcare industry continues to adjust for the times. These positive adjustments are prevalent in all facets of healthcare from the number of new medical facilities erected each year to explosive employment and salary growth in just about every healthcare occupation. Healthcare occupations. Employment among healthcare occupations is expected to increase by 29 percent. This growth, resulting in a projected 3.5 million new jobs, will be driven by increasing demand for healthcare services. As the number of elderly individuals continues to grow, and as new developments allow for the treatment of more medical conditions, more healthcare professionals will be needed. Within this group, two occupations are expected to add a substantial number of jobs: registered nurses, with some 711,900 new jobs; and home health aides, with roughly 706,300 new jobs. Much of the growth in this pair of occupations will be the result of increased demand for healthcare services as the expanding elderly population requires more care. Healthcare and social assistance. The healthcare and social assistance industry is projected to create about 28 percent of all new jobs created in the U.S. economy. This industry—which includes public and private hospitals, nursing and residential care facilities, and individual and family services—is expected to grow by 33 percent, or 5.7 million new jobs. Employment growth will be driven by an aging population and longer life expectancies, as well as new treatments and technologies. While California has the highest employment levels for pharmacy technicians overall, three metropolitan areas have higher employment levels than the populous Los Angeles-Long Beach-Glendale, CA metropolitan area. They are the Chicago-Joliet-Naperville, IL Metro area, New York-White Plains-Wayne, NY-NJ, and Houston-Sugar Land-Baytown, TX. Including the metro areas listed above, the following metro areas (consisting of one to three major cites) have the highest employment levels in the country. This means, aspiring pharmacy technicians have a better chance of landing a job in these cities over most all others. While the 28 cities listed above are at the top of the list of cities for jobs for pharmacy technicians, most states have experienced promising employment growth overall between 2006 and today. 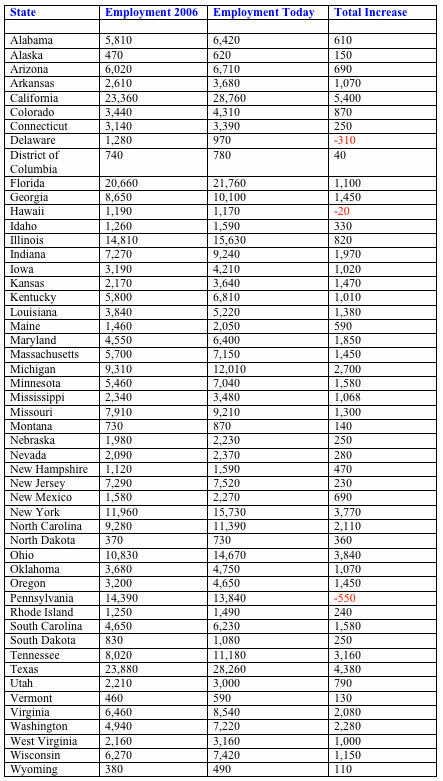 The following list includes employment information for all 50 states and D.C. With the exception of Delaware, Hawaii, and Pennsylvania, employment increases total several hundred to well over several thousand per state. It is important to note that while Pennsylvania lost jobs between 2006 and today, the state still has one of the highest populations of pharmacy technicians in the U.S. The states that showed the most significant employment increases between 2006 and today include California, Indiana, Maryland, Michigan, New York, North Carolina, Ohio, Tennessee, Texas, Virginia, and Washington.